Some things in life are just too good to come to an end. We get so excited to see those beautiful blooms arrive in spring, as tulips and daffodils add a range of vibrant color to our yards. But it isn’t long before summer draws the curtain on our most stage-worthy specimens and we bid them farewell until the show returns next spring. Your tale doesn’t have to have such a dreary ending. What if the same garden spaces could burst with color through summer and even into the fall? Just like anything hard that we work at, gardening is about doing the best we can with what we have. And nature’s best often surprises us. If you choose the right varieties of flowers and plants with staggered, long-blooming periods, you can keep continuous color in your garden throughout all three growing seasons. With some keen knowledge on the longest-blooming plants that thrive in our region, you can design a garden that casts them in leading roles, taking turns from early spring to late fall. You can choose a mix of perennials, annuals, small shrubs, and even container plants. Because there are so many options for flowers and plants that bloom in our area each growing season, we’ve outlined suggestions for a basic, lowmaintenance flowerbed that only calls on perennials for this tough task. Yes, they have a short bloom period (some only two to three weeks), but you’ll be amazed at what you can achieve by combining early, mid-season, and late-blooming varieties. Plant taller flowers and flowering shrubs, which can add structure to the garden, in the back of the flowerbed, and then stagger your other varieties down to the smaller plants near the front so the whole show can be seen at once. Broader, thicker shrubs can fill out and line the outside and back edges. Perennials are best planted in clusters, but if your three-season garden doesn’t end up as full as you’d hoped, that’s where annuals can come in. You can use them to fill in any bare spots or plant them in decorative containers that can be moved as the different perennials grow and spread out. You may find that after a few years, when the perennials have had time to reach their potential, you are spending less money and time on annuals. The ideas here adhere to a “rule of threes,” meaning we have broken it up not only by what you can expect each season in our area, but also by three different height categories, or tiers (tall, medium, short). We’ve given you multiple options for each. A garden planted in this fashion works best against a permanent structure, such as a house or a fence. But it can be customized for any size garden, by adding multiples of the same plants for larger spaces. The rule isn’t steadfast, of course, but a concept that can be easily adapted for even the casual gardener who enjoys having their own show to direct. Before heading to your local nursery, it’s also a good idea to take measurements of your garden space, then sketch it out on paper to determine roughly how many plants you will need. Many of the varieties here come in different colors, so keep your colored pencils handy, too, if you want to create a different color palette with each tier. 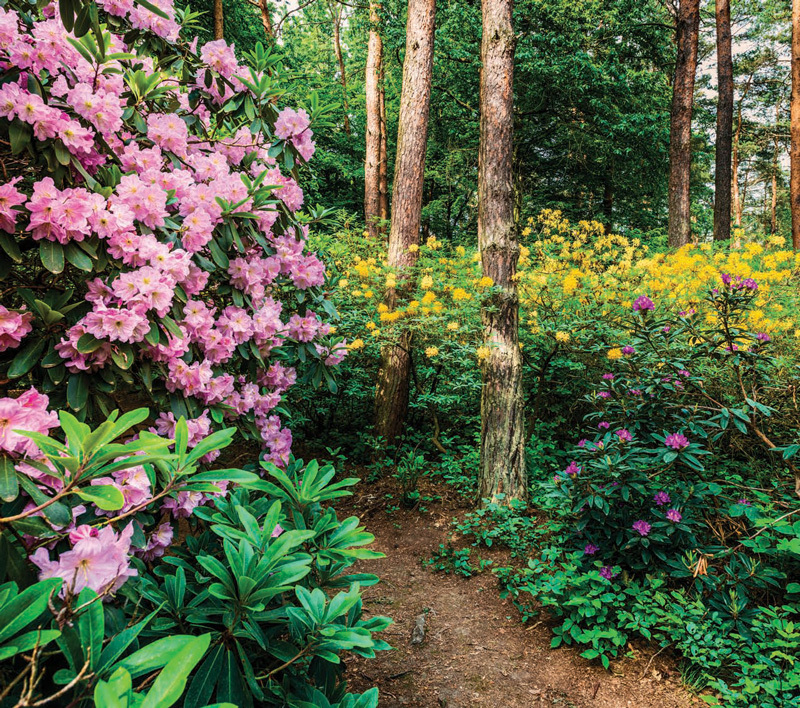 Start the season with large bursts of color at all three tiers of your garden. 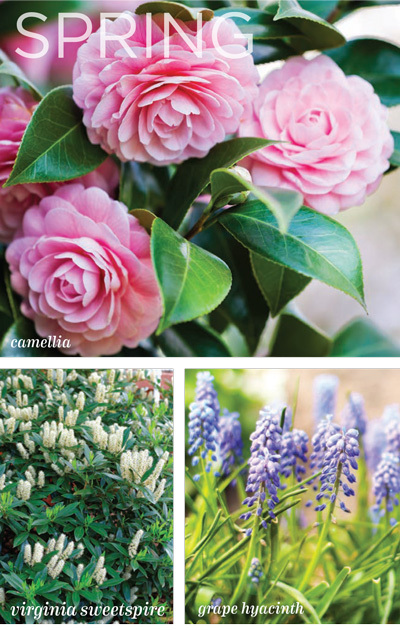 In the back—the tallest level in your garden—try a spring-blooming camellia (there are also fall- and winter-blooming cultivars) which produces large flowers that are great for cutting; the old-time favorites azaleas and rhododendron; hibiscus, for a tropical feel; or Virginia sweetspire (or the Virginia Willow), a deciduous flowering shrub that can grow from two to five feet and features attractive reddish new growth in early spring, then has drooping white brush-like stem flowers later in the season. It keeps green foliage through the summer and then puts on a show of nice red foliage in the fall. In the middle level, use plants that grow typically shorter than the shrubs. Go with the ever-faithful daffodils and tulips (best planted in bunches). The lowest level is where you can use border plants, and even groundcover. Enter crocus (one of the earliest bulbs to bloom); grape hyacinth (best to plant in groups of three to four dozen); or baby’s breath Gypsophila (a star in the garden because it can start blooming in late May and, if cut back after first bloom, can even repeat and bloom through to fall). 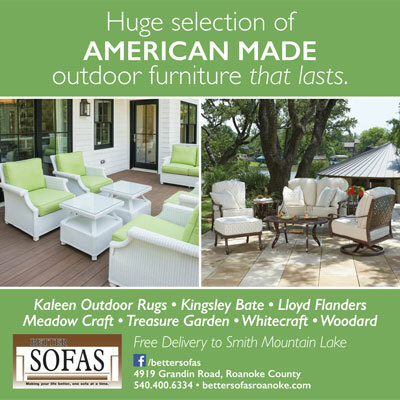 As the spring-blooming shrubs begin to lose their blooms, their foliage will stay green through summer, making a perfect backdrop for more color to enter the scene. You can go right to work on your mid-level plantings to go in front of the shrubs, choosing from favorites such as gladiolus (a showy perennial that sometimes grows best as an annual); German bearded iris (another wonderful cut flower); Asiatic or Oriental lilies; sedum “Autumn Joy” (another star because it can bloom in mid-summer to late fall); or salvia, a mainstay of flowerbeds and cottage gardens for its simple, country wildflower appeal. Many of these are great perennials to bloom in front of the spring bulbs as they die off and can run cover for the dead foliage. Oakleaf hydrangeas will bloom in early summer (other hydrangea varieties will bloom mid-summer). Note: There are many cultivars of hydrangeas, coming in all sizes and blooming in blue, pink or white. Their best attribute may be that their fall foliage can turn a red-maroon and help you continue your colorful display into another season. Other hardy summer favorites are Shasta daisies (often blooming and reblooming up to three times during the season) and black-eyed Susans (these may bloom through fall, until the first frost). Or consider the ever-popular evergreen daylily that has been dubbed the perfect perennial for its year-round foliage and rainbow of varieties. Other plants you may want to try for long-blooming color include aster, coreopsis and yarrow—all blooming about 10 weeks. For the border, try monkey grass (liriope), which has thin stalks of blue, purple or white blooms in late summer; summer phlox; and hosta (which can provide attractive edging at your border but can also play versatile roles as a follow-up to the spring bulbs). 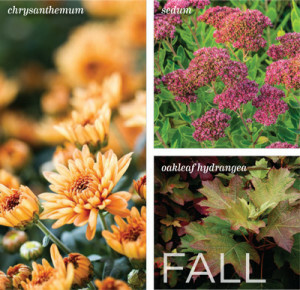 Finale If you choose wisely from these lists, several plant varieties will be still be putting on a show for you with their blooms and foliage in the fall as they turn shades of yellow, orange and maroon. Remember you can always dress up the scene with varied shades of potted mums. Then when winter begins to set in, assess your gardening year and make notes for adjustments next season. Maybe you want to go with different colors, expand your space, or add more variety next year. Sit back and enjoy the last blooms before the frost comes—and give yourself three cheers for three seasons of beauty.